Planning an autumn harvest party is a great way to usher in the fall season. You can pick from the crop of fall party ideas to make your next celebration one that combines friends and family for a great time. As with any party, having entertainment planned can keep kids busy and adults socializing. 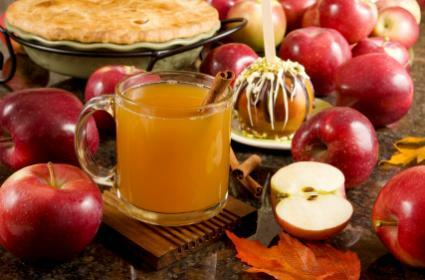 An autumn party can be held at home or you can plan a "destination" party that everyone will enjoy. This type of party can be held from mid-October to mid-November just before the holiday rush. Set up a craft section with supplies like leaves, acorns, nuts, and beads. Have kids glue them onto a foam wreath to take home. Another crafty fall idea is to have kids spread peanut butter onto pine combs and cover with birdseed or crushed corn/walnuts for birds and squirrels. Kids would also love decorating their own leaf cut-out cookies. Pumpkin carving is a great way for adults and kids to interact. Take advantage of the cool fall weather and set up an area outside for adults to carve and children to scoop out the innards. Be sure to save the seeds and toast them as a snack for later. If you live out in the country, host a barn dance. Teenagers and adults will have a great time listening to country-western music, sitting on hay bales, and partying into the night. Discount tickets may be available for some places, especially at the end of their busy season. People in warmer climates may be able to even host a fall pool party before they drain their pools at the end of the season. Horseshoes is a fun and easy game to keep everyone entertained at an autumn party. You could even set up a round-robin tournament. A large dartboard hung at one end of the room can also provide plenty of adult fun. Music and dancing are always welcome at a party. Hiring a band can get expensive, so if funding is tight, pop in a few favorite CDs and let everyone get down. Talented musicians may be among you, so ask them to bring their guitars or keyboards. Children's play tractors, trucks, and farm sets can be placed around the room. Setting up a miniature barnyard can be a harvest party idea to keep kids busy while the adults socialize. A few fall craft favors for the kids, like decorating fall cookies or mini pumpkins, are also good to have on hand. Hosting a potluck is another popular idea for an autumn party. You can choose to theme the food around a fall color or simply make the main dish and ask everyone else to bring sides or a dessert. Making the party a potluck will ensure that everyone gets to try a new food. You can continue the harvest theme by asking they use a product or by-product in the dish that was made with one of the local crops. You can make a campfire at the end of the evening and roast marshmallows to make s'mores as dessert. You may also want to serve a few special hard liquor drinks to your guests. Pick up the mixings for one or two special drinks such as an apple martini or a rum punch. If you decide to host the party in an outdoor location such as a barn that has been cleared for the occasion, use decorations that fit into the surroundings. You can place hay bales to fence the party area in. If the weather is accommodating, a bonfire outside can be a great addition to your party. Plaids, ginghams and checks are great for invites, napkins and tablecloths. Hang shovels, pitchforks, tools and other hand equipment on the walls. A small lawn tractor could be waxed and in the corner to add a little extra ambiance. If you have a flagpole, put a cornshock up around it. Give your guests something to remember the party by. 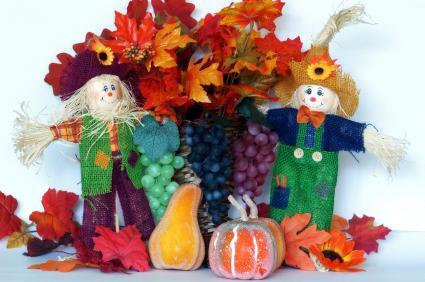 Send them home with party favors such as an autumn candle or a fun scarecrow decoration. 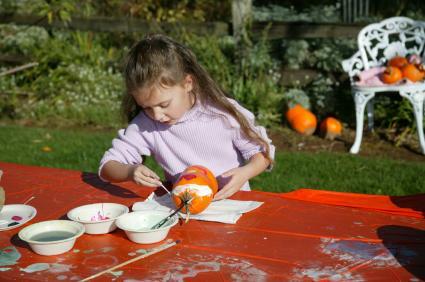 Kids can take home the crafts they made and pumpkins they carved. 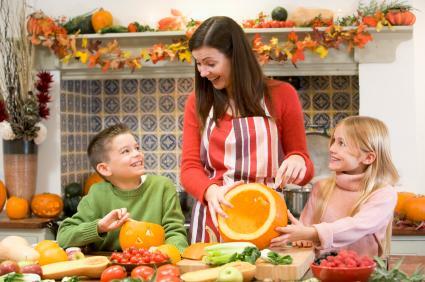 Hosting an autumn harvest party is a wonderful way to lead off the string of fall and winter activities. Call friends, family, and neighbors to get the party started right. Enjoy this time before the rush of the holiday season keeps everyone too busy to gather together.